The Neptune’s Rangers is a serious group of rock gardeners. Rock gardening is basically extreme sea kayaking along a rocky coastline. Rock gardening is a dangerous sport. The idea is to catch and ride an ocean swell as it makes its way over and through rocks and reefs. Successful rock gardening depends on the ability to time ocean swells and anticipate their interaction with massive shoreline formations. So what is the draw to rock gardening? Well, some think it may be the negative ions found along the shoreline that produce biochemical reactions within us as we inhale them. It may be just simply the adrenaline rush. 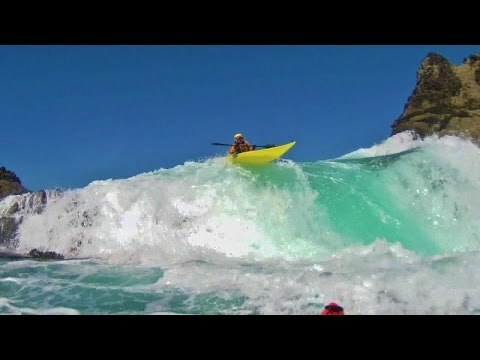 When I mention kayaking, people generally envision paddling on calm lakes or down mountain rapids, and if I talk about whitewater, they’re almost certain to think I’m referring to a river. But there is another type of paddling found in coastal regions. There, swells generated by wind in a distant storm end their long journey to land with a fantastic result: ocean whitewater. Often, the swells will break on a long, sandy beach or a shallow reef, creating nicely formed waves to surf. 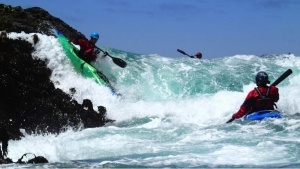 Other times, they collide with, or flow through, a rocky coastal shoreline, creating a unique area to play in kayaks. This is called rock gardening! See Next Page below to see a video fo the Neptune’s Rangers in action.